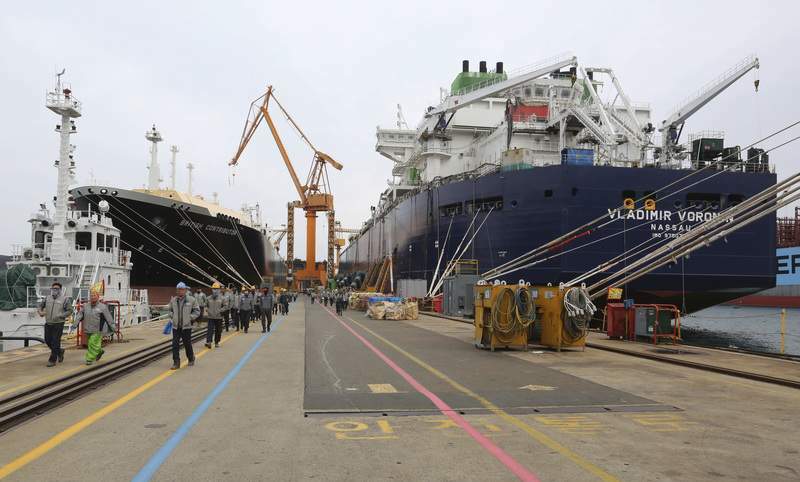 Associated Press South Korea has stepped up production of ships to transport liquefied natural gas from the United States to Asia. GEOJEDO, South Korea – In South Korea's largest shipyard, thousands of workers in yellow hard hats move ceaselessly between towering cranes lifting hulks of steel. They look like a hive of bees scurrying over a massive circuit board as they weld together the latest additions to the rapidly growing fleet of tankers carrying superchilled liquefied natural gas across the world's oceans. Environmentalists counter that the massive new supplies unleashed by American advances in extracting natural gas from shale doesn't just make coal-fired power plants less competitive. LNG also competes with such zero-carbon sources of electricity as nuclear, solar and wind – potentially delaying the full adoption of greener sources. That's time climate scientists and researchers say the world doesn't have if humans hope to mitigate the worst-case consequences of our carbon emissions, including catastrophic sea-level rise, stronger storms and more wildfires. South Korea's big three shipbuilders – Daewoo, Hyundai Heavy Industries and Samsung Heavy Industries – won orders for 53 new LNG carriers in 2018 at about $200 million each, soaking up the lion's share of the 62 vessels ordered globally, according to numbers compiled by the London-based shipping group Clarkson Research. South Korea is expected to finish 2018 at the top spot in overall orders for new commercial ships, surpassing China for the first time in seven years. American LNG exports quadrupled in 2017, with this year on track to see similar growth. Nearly a fifth of all that gas goes to South Korea. The British Contributor is the third of six LNG carriers being built by Daewoo for British energy giant BP, which will mainly use them to transport U.S. gas to Asia under a 20-year contract with the Freeport LNG facility south of Houston. Daewoo delivered four similar ships this year to the government-owned Korea Gas Corp., which has a 20-year deal to buy gas exported from Cheniere Energy's Sabine Pass LNG terminal in Louisiana. In China, the Communist government has declared a “Blue Sky Defense War” to reduce the choking smog in Beijing and two dozen surrounding cities with a program to convert hundreds of thousands of homes and industrial facilities from burning coal to gas. In February, Cheniere signed a 25-year deal with the state-controlled China National Petroleum Corp. to export LNG from Corpus Christi, Texas. But the increased gas exports from the U.S. and other sources hasn't really put much of dent in Chinese coal consumption, which has remained largely flat in 2018.